Here is a lovely antique Edwardian black silk dress with deep red trim. 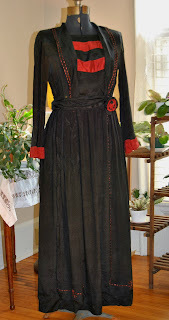 The piece has simple yet elegant styling with thick silk embroidery in the same shade of red as the ends of the sleeves, the inserts on the bodice and large flower on the end of the belt. 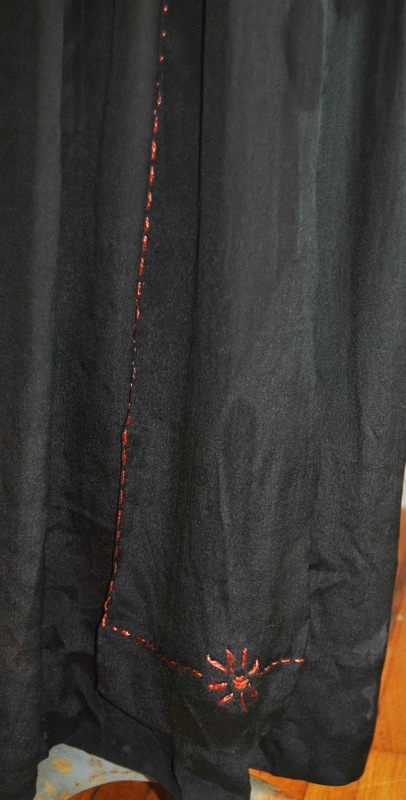 Both the front and back of the skirt have two attached panels (4 total) about 7 inches in width that top the entire length giving the skirt added fullness and extra movement. 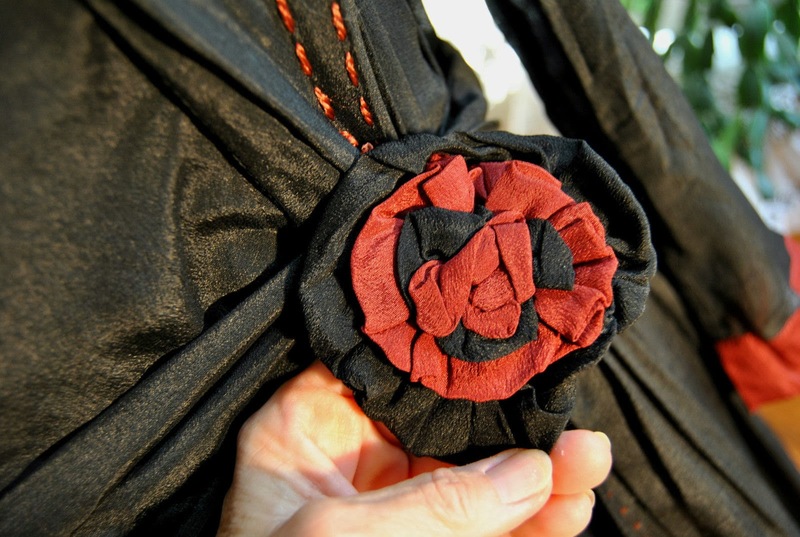 They have a simple Arts & Crafts flower design at the hem that definitely catches the eye. The belt is attached at the left side of the waist, wraps around and tucks under held in place by the lovely flower of bunched red and black silk. The bodice closes on the left side by a series of snaps well hidden under the collar to the waist. There are two hooks inside the (heavy satin) waistband and two more snaps below the waist. One of the waist band hooks needs a stitch to put it back in place but everything else is secure and in fine condition. In fact overall there are few problems considering the age of the gown and the silk fabric. 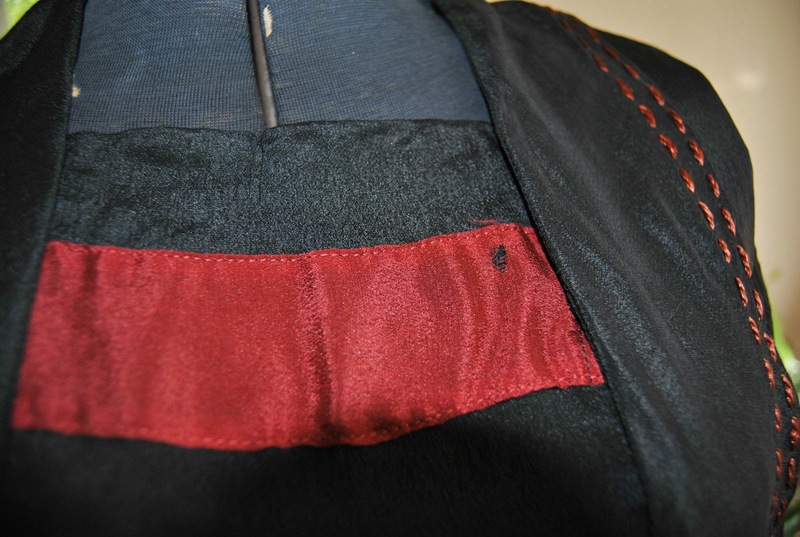 The most obvious flaw is a small hole in one of the red stripes on the bodice. This could be restored using some of the matching silk in the flower. 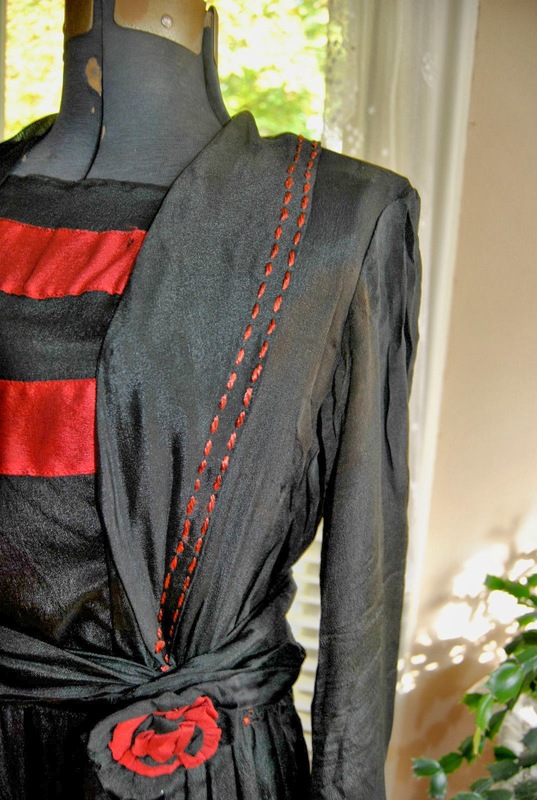 Otherwise there are only a few pinholes in the skirt that are only noticeable when held to light and the fabric on the sleeves is in superb condition. The back of the collar needs some of the embroidery put back in place and it will be a simple repair. There is a bit of discoloration under the arms and a few light spots on the skirt that I believe can be removed by proper cleaning. This is a beautiful dress. 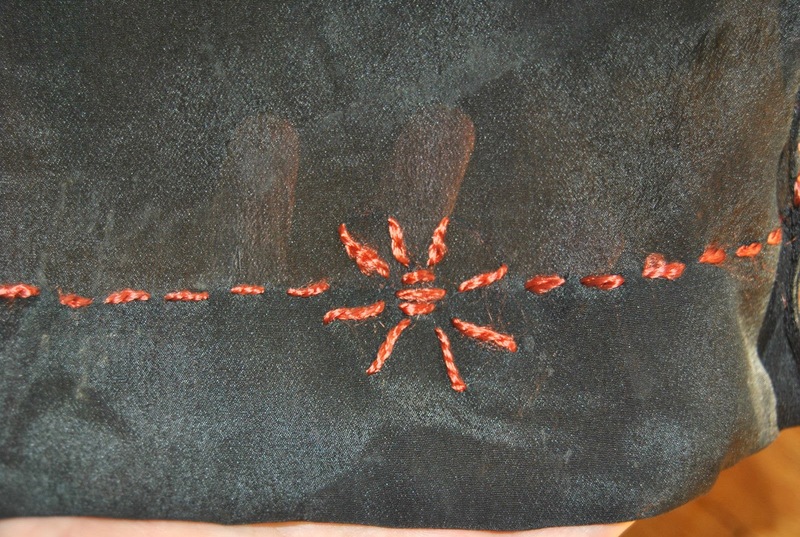 Extremely well made with tiny stitches both machine and hand…. Measurements are.... Total length 51 inches from the top of the collar to the hem.....Bust 19 across lying flat and...... waist 15 inches lying flat. I need to re-create this dress! 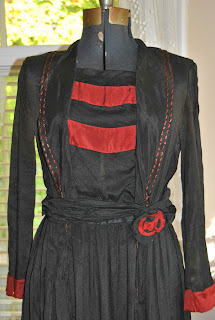 Black and red is one of my favorite color combos to wear so this would be a perfect dress for me. 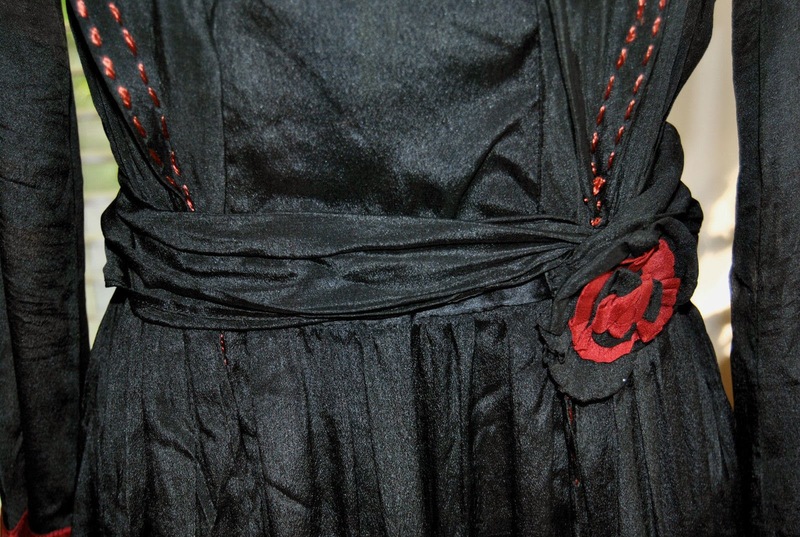 I adore how the red is used as an accent color to really bring out the details in this dress. Black and red is one of my favorite colour combinations too! 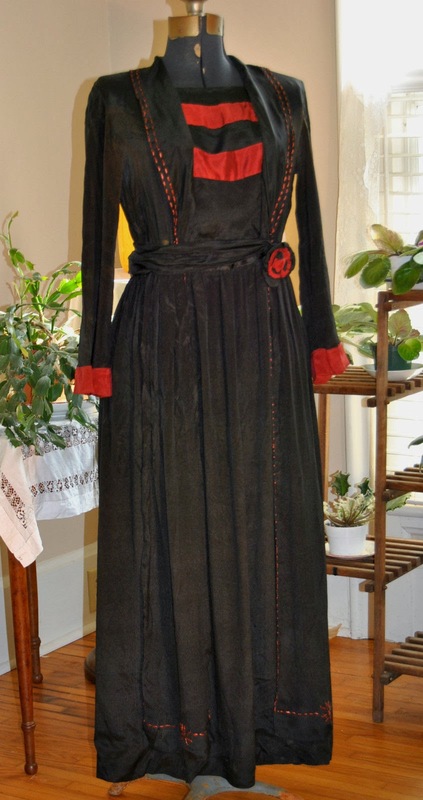 I would definitely wear this if I were an Edwardian lady. Doesn't it just look like a fun day dress?